With these set of samples, this knotted cretan stitch sampler is completed. 10. in this row , the knotted Cretan stitch is combined with a variation of feather stitch. 11. this row, after making the knot on the Cretan stitch, a slanted chain stitch is worked, this step is repeated till the end. 12. this time , the knotted Cretan stitch itself is slanted, the first two attempts, I did not get it right, later got the hang of it. 13. wheat ear stitch is worked in the spaces of the knotted cretan stitch line. 14.after working a row of knotted Cretan stitch, a zigzag back stitch is worked above it and fly stitches are worked below. 15.I tried working detached chain stitches on this row of Cretan stitch. 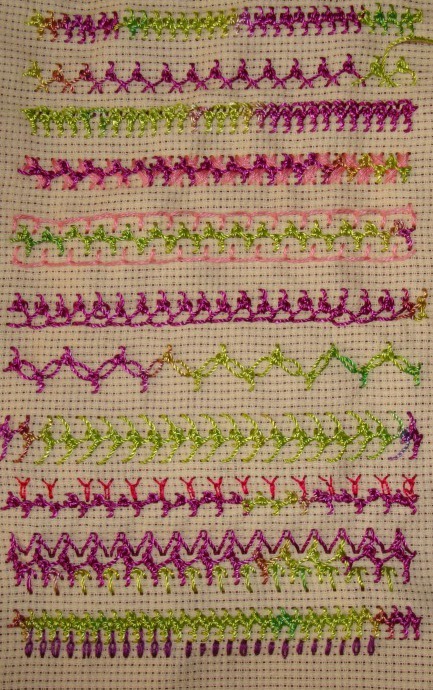 When working on this sampler, I did not use many colours, the cone thread I used was variegated. I found that using one thread saves time. 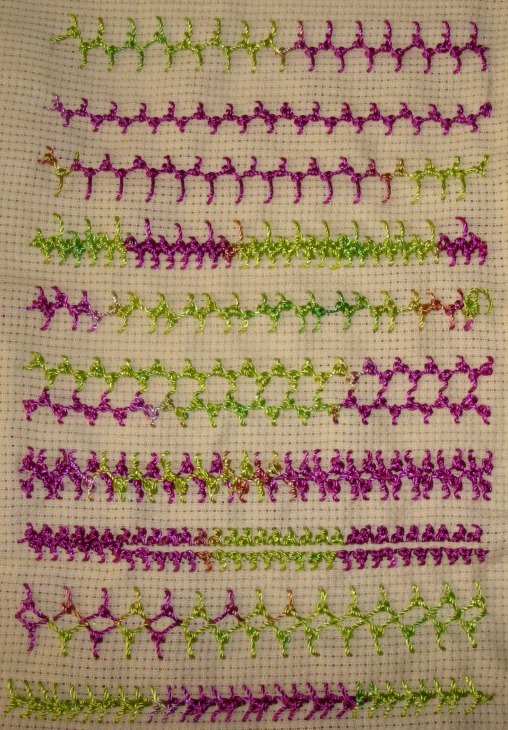 And the sampler also looks better without the confusion of many colours. Today I worked this stitch by combining with some other stitches. I like working like this, it totally changes the look of both the stitches, I feel as if I am discovering new stitches. Now for the details. 5. In this row, I combined knotted Cretan stitch with cretan stitch. 6. in this row, knotted Cretan is combined with herringbone stitch on one side. 7.This row, the combination is knotted Cretan and chevron stitch. 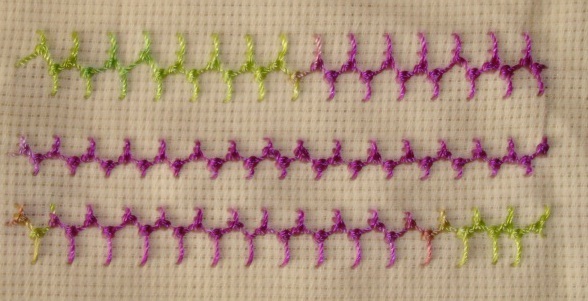 8. here, a row of herringbone stitch is worked in pink, over that knotted Cretan stitch is worked, first over the crosses and later in the space between the stitches. 9. knotted Cretan stitch is worked between two rows of buttonhole stitches. Tomorrow I’ll try combine some other stitches with this stitch, this sampler is getting very interesting for me!